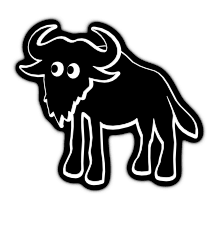 The free software GNU operating system, which began development in 1984 is now used by millions of people worldwide as a replacement to both Microsoft Windows and Apple's Mac OS X operating systems. Because most software we buy or download from the web denies us these rights, we can look at the reasons why: usually we don't actually buy ownership of the software but instead, receive a license to use the software, binding us with many fine-print rules about what we can and cannot do. We should be able to make copies of software and give them to our friends, we should be able to figure out how programs work and change them, we should be able to put copies of software on all the computers in our home or office — these are all things that software licenses are traditionally designed to prevent. Enter the free software movement: groups of individuals in collaboration over the Internet and in local groups, working together for the rights of computer users worldwide, creating new software to replace the bad licenses on your computer with community built software that removes the restrictions put in place and creates new and exciting ways to use computers for social good. Through our Working Together for Free Software campaign fund, you can donate to help advance free software in specific areas. Прочитайте эту страницу на русском языке.